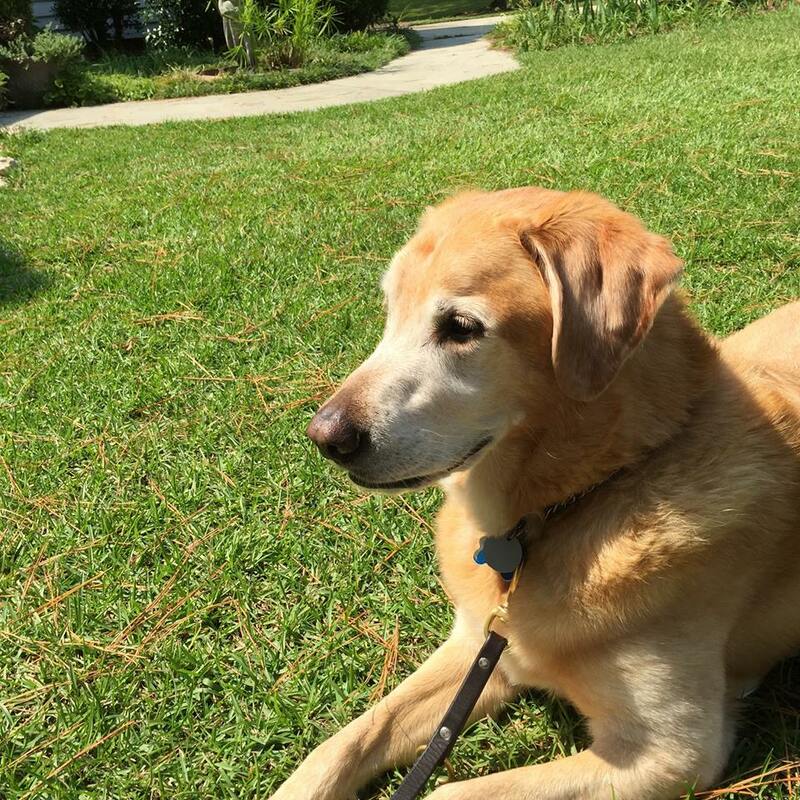 Pictured here is the retirement portrait of Brego (Columbia, SC). Brego is the first guide of Dixie Land GDU member Ann Humphries. He returns to his loving puppy raiser family, the Gruvers of Montgomery, AL on September 13th. Ann says, "Brego has been an exceptional guide. We've had so many wonderful adventures. He has a huge fan club!" 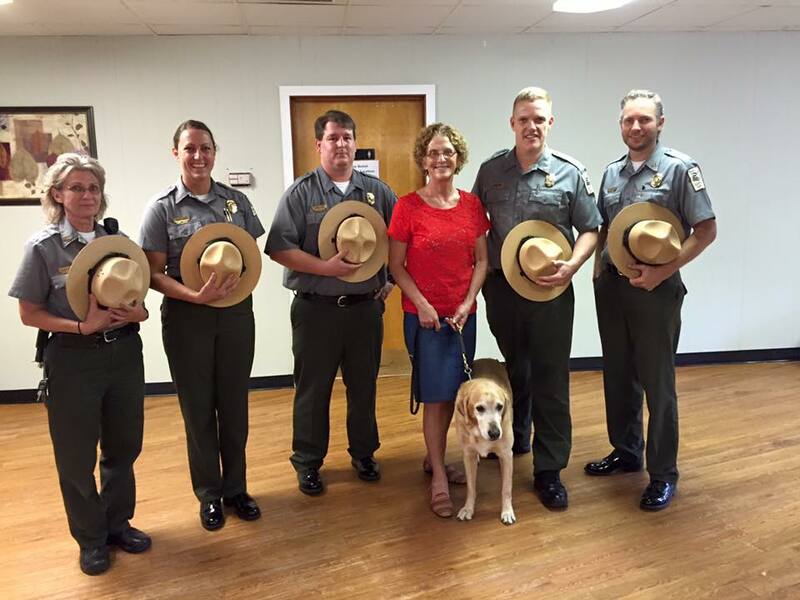 Brego was awarded "Ultimate Outsider Status" by the South Carolina State Parks. He has stayed in 22 parks! The parks are commissioning an "Ultimate Outsider" pillow for Brego. Our prayers are with both Brego and Ann during this time of transition. Dixie Lander in "Hawg" Heaven! Dixie Land GDU member Ann Humphries, Columbia, SC was guest of Chuck & Carol Beaty , long time friends from Spring Valley Presbyterian Church, who arranged a morning country back- roads trip on a Harley Davidson Touring bike. Brego (Ann's guide dog) sat out this trip, but only after sniffing the tires. The driver described the country scenery. Kirk joined Ann and the host couple for lunch in historic Ridgeway, SC in Fairfield County. 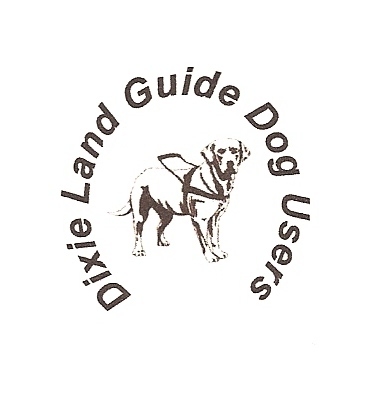 Once again, in keeping with our ever-present attempts towards sensitivity and awareness education, Dixie Land Guide Dog Users sponsored another Dinner in the Dark, co-hosted by our great friends at Grace United Methodist Church. Much preparation was required to have such an event. Assignments had to be made; food purchased and prepared; room set-up; volunteers in place; blindfolds made; bibs constructed; and advertisement sent! Thanks to the great relationship Dixie Land Guide Dog Users and the nice young ladies at the College of Charleston's Delta Gamma sorority share, our bibs were completed in less than an hour! Those girls set up an assembly line, cutting and converting large trash bags into stain-repellant plastic bibs. Some even showed up to take advantage of the great food, fantastic fellowship and fabulous furries! Volunteers from Grace UMC cut the yards and yards of material into blindfolds, prepared signs, set up the fellowship hall and actually served the piping hot, scrumtee-da-lishus, mouth-watering, palate pleasing spaghetti, garlic bread and 'nana pudding Chuck prepared. Some of our Dixie Landers present to enjoy the evening were Audrey Gunter, (with Jessie) President, Tweety Ford, (with Evonne) Vice-President, Laurel Jean Walden, (with White Lightn'in) Secretary/Treasurer, Sheryl (with Houston) and Russ Hedrick (with retired guide, Luke), members. The only thing better than the food was the fellowship we all enjoyed! Sorry YOU couldn't make it. Maybe next time…and there will be a next time. Hope to see you there! The silence now enveloping the hotel is almost deafening. The somberness of the lobby is more like that of a funeral home than that of the laughter filled, dog-jammed, crowded hotel where fun-loving folks of all ages and their helpful furry guides gathered with joy and enthusiasm. The staff stands there teary-eyed, fondly remembering the group they'd come to know so well in such a short amount of time. The housekeeping staff has already begun to vacuum the mounds hair and crumbs unknowingly left there by their 2 and 4 legged guests. Top Dog-Charleston is now history-a memory…but what a memory it was! Some arrived as early as 7 days prior to our opening ceremonies to escape from the bone-chilling frigid temps of their home states and, of course to live, taste, hear, touch and breathe Charleston. Most planned to take advantage of our great prices and better climates by extending their stays for at least 3 additional days. They came from everywhere! California, Washington, Texas, Colorado, Minnesota, Connecticut, New York, New Jersey, Ohio, Massachusetts, and many, many other states were well represented in our ranks. Total strangers when they arrived became close, forever friends when they departed. Folks who had experienced valid differences of opinions in the past put those issues aside and were soon hugging each other in the hallways! Some would say the catalyst was the charm and spirit of our "Holy City" but I believe it was simply God continuing to offer His blessings to us, through us and among us. 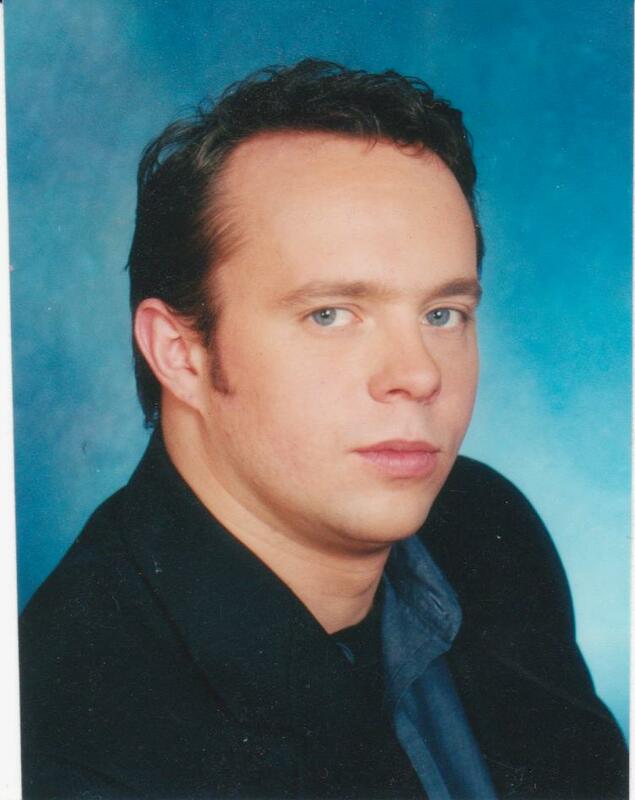 The journey began almost 2 years prior with a handful of Dixie Landers and a limitless number of ideas. They worked together to find just the right venue-the right programs-the right caterer and the right entertainment. GDUI had been badly fractured and no one knew whether anyone would even attend Top Dog, but they continued on with their search, soul depending on God's Divine Guidance. They'd learned long ago that God is, indeed a gentleman. If invited, He'll always attend and bring His bountiful blessings. If left out, He stands silently by as a spectator, and reserves those many blessings. They remained faithful and obedient, inviting any and everyone who wanted to attend. No one was omitted. Their objective was to make everyone feel wanted, welcomed and loved and they began with their initial invitation. At first a few began to respond; then more and then, even more. Soon, within 2 months, over 50 had been registered. Friday morning's events started with Dixie Land's very own Brianna Murray and Kimberly Taylor presenting our "Paws 4 Technology". Soon Janet Ingber joined in to bring everyone up to date on the use of the iPhone and iPad. Before the Opening Ceremonies began on Friday night, 154 people had registered-94 blind, 81 with guide dogs; 19 vendors; 9 guide dog schools; umpteen puppy raisers and dozens of loving, supportive friends and/or spouses. That meeting room was crowded more than ever. People were elbow to elbow and furries, tail to snout! The mumbling roar became silent as Laurel Jean and Audrey offered their official welcome! Pastor Ed Grant officially started our event with a heartfelt prayer of invocation. When Laurel Jean began to sing "that" song ("The Blessing of Your Love") written specifically to speak of the love between handler and guide, loving tears began to flow. Bob Acosta then read a brief history of our flag and the brave veterans from the American Legion, troop 179 proudly marched in to "Present the Colors". Debbie Grubb then stood to draw a correlation between the various Bugle Calls and the many stages of life for a guide dog team. Our national GDUI president, Penny Reader rose to update us all on the latest development of that organization we knew and loved. Over 10 people and/or organizations were recognized for their generosity and support before a brief intermission was called and our delicious "Frogmore Stew" began! Soon lips were smacking and folks were laughing as they attacked the mountains of fried chicken and shrimp on their plates. Because our guests had completely occupied all of the rooms at the Comfort Inn & Suites, West Ashley, we were given a little more latitude so we grabbed the tables and chairs from the breakfast area and converted the entire lobby into a swanky restaurant. When all had eaten as much as they could and their dogs relieved, they retired to their rooms for a much-needed rest in order to prepare for the next day. Saturday began with Pastors Bonnie Miller and Deb Trevino officiating at our Christian ceremony, "The Blessing". They each offered a prayer prior to Laurel Jean's tribute to those guides that had retired recently. Afterwards Laurel initiated a special, audible candle lighting salute to those guides that had crossed "Rainbow Bridge". As she called the name of each of our heroes, a lone chime would ring to honor their memories. A prayer station with 2 empty, upside down harnesses and an upside down food bowl was prepared for folks to visit and remember. The ministers assigned at that station were so moved by those who visited that prayer station that they, themselves needed consoling. They'd never experienced a love between human and animal like that illustrated before them that day. Marshall and Michael from Sun Dog Cat Moon talked with us about emergency first aid supplies and the benefit of massage therapy for our guides. Afterwards we heard from the many puppy raisers in attendance! (Did you know that I love puppy raisers?) I think as handlers, we were all surprised to find out that these heroes who have given us our angels actually admire and respect us as much as we admire and respect them! Following the tears and cheers from and by our puppy raisers and guests, we all took a break to enjoy our scrumptidalicious boxed lunches. Mind you, while all of this was taking place our exhibit hall was buzzing with visitors upstairs and our motorcyclists were rounding up their next victims…I mean riders. After lunch Penny Reeder brought us all up to date on GDUI-the hurdles and obstacles already conquered and remaining to overcome. Becky Barnes Davidson and Dr. Deni Elliott spoke about the various airports that offer relief areas within their security zones. Afterwards they ramrodded us on that especially touchy topic of fake service dogs and how they affect us, legitimate handlers. Both ladies offered an extremely informative, invaluable view into the problem and various diverse, and even unpopular at times resolutions. Many guests shared their personal insight towards the issue. The discussion became heated at times, but that was simply because of the passion felt towards the subject. Our last scheduled discussion, "Pup dates from the Guide Dog Schools" was quite informative and uplifting. 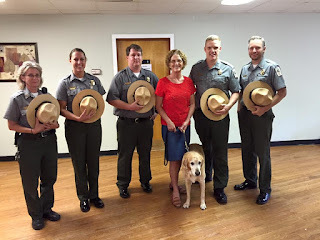 Representatives from Fidelco; Freedom Dogs for the Blind; Gallant Heart; Guide Dog Foundation; Guide Dogs for the Blind; Guiding Eyes for the Blind; Leader Dogs for the Blind; The Seeing Eye and Southeastern Guide Dogs did a great job in bringing us up to date on their latest endeavors. Afterwards, they all met outside to erect and oversee a great obstacle course that only the brave and confident would embark upon. There were many of them there, too-all with chests puffed out and "I knew we could" smiles on their faces. Saturday evening ended with another lip-smacking, tongue titalating lowcountry cuisine straight from Jaimie's smoking barbecue pots! Yum! Yum! I can still taste that good ol' slap your mama good chicken and pork, perfectly seasoned and lovingly prepared! Our event closed with the hand-clapping, finger-snapping, foot-tapping music of Ann Caldwell and the Magnolia Singers melodically transporting us through history to a much different, simpler-yet not so much nicer time. Everyone there enjoyed her "Gullah-Geechie" from another era and culture. Sunday morning began early with folks leaving for their red eye flights back home. The majority of our guests were checked out and gone by noon, leaving just a handful to reminisce about Top Dog-Charleston and plan for Top Dog-Orlando! By all accounts, our event was extremely successful, thanks to everyone in attendance and, especially to God! We'd also like to offer a special note of thanks to all of our many wonderful volunteers and the management and staff of the Comfort Inn and Suites, West Ashley. All there went way out of their way to accommodate each of us, but there were 2 ladies in particular who sacrificed their day off to return just to assist us with our breakfasts! Thank you, Miss Angela and Miss Cynthia! So, Top Dog-Charleston is now history and we all look forward to hearing more from Debbie and Kathleen as Guide Dog Users of Florida begin to plan and prepare for Top Dog-Orlando in 2017! Here is a list of pictures and audio from Top Dog, 2015. They are on Dropbox, and you must either sign up or sign into Dropbox to access them. You can copy and paste the URLs into a new window of your browser.